Dual Extrusion but with only one material touching the build plate? Posted April 1 · Dual Extrusion but with only one material touching the build plate? Does anyone know if CURA can handle more than one model at on the build-plate but with only one touching? I have a part where I want to extrude the main body in one color of ToughPLA and then another section in a 2nd color of ToughPLA. My part will have the base model on the build-plate and the 2nd model centered over the first but at about 2mm above. The two models are designed such that they nest together, so there are not any gaps or voids. 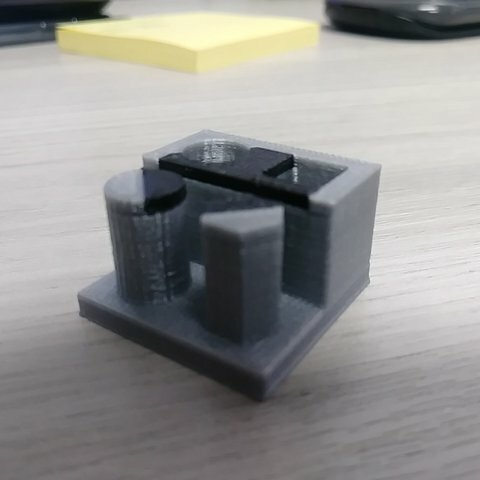 The issue I am having is that CURA will not let me move the 2nd model above the build-plate. Every time I try, it snaps the model back to Z0. I can work around this by having the void in the 1st continue through the model, but it results in much more of the 2nd material being used. I assume I'm missing something since the sample print included with my S5 seems to depict what I am trying.